Cayenne is used all over the world to treat a range of health problems, including heart disease, chronic pain, poor blood circulation, sore throats, and headaches. Cayenne increases your blood flow faster than any other herb. Simply by moving blood. Cayenne pepper is one of the ten most important herbs to have at home, just because it makes the other nine work better. When taken internally, cayenne calms the digestive tract and stimulates the stomach secretions and saliva. These secretions include substances that help digest food. 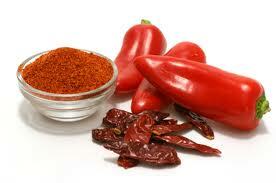 One of the greatest blood circulation stimulant known today is again cayenne. You can drink milk as much as you want, but if you have bad circulation to your liver, it's not going to do any good for you. When you have a sick area in your body, there is often a limitation of blood flow to that area. Blood flow is what takes nutrition to those cells. Blood flow also carries out and removes waste materials. Cayenne Pepper is like a bomb! It blasts through any blockage to get to the area that is sick, taking with it all the minerals and vitamins from the foods you eat and all the vital chemicals from the herbs you take through to the sick area. Those who are not used to cayenne need to change their minds. However, for those who have never used cayenne pepper before, a good primary dosage is 1/16th of a teaspoon. Change your dosage up slowly. Put a small amount in some juice, stir it in thoroughly and drink. Many people recommend cayenne powder to be used in capsules. Although herbalists truly believe that you are getting only a small part of the potential value of cayenne pepper by taking it in capsule form. When you put cayenne powder in your mouth, your stomach secretes digestive juices before the cayenne gets down there. So when the cayenne arrives, your stomach is ready for it. But if you swallow a capsule, your tongue tastes nothing, and stomach tastes nothing until, five minutes later, the gelatin melts; and you get a half-teaspoon of cayenne pepper right in your stomach. Surprise! Your body is stunned. Now, going backwards, if cayenne itself touches your tongue, it starts to be absorbed in seconds, and your nerve endings transmit signals throughout the body, sending waves of fresh blood wherever it's needed. Cayenne may be taken at a dosage of 0.5 to 1 gram three times a day before meals. Pepper has been known since the beginning of civilization in the Europe, having been a part of the local diet since about 7,500 B.C. The Spanish discovered the pods in the New World and brought them back to Europe. Before the arrival of the Spaniards, the indigenous peoples throughout Central and South America used cayenne medicinally: the Aztecs used it to relieve toothache, while the Mayans used it to treat asthma, coughs and sore throats. Ayurveda utilizes cayenne to treat poor digestion and bloating, and traditional Chinese medicine uses cayenne for digestive ailments. Cayenne inherited its name from the port capital of French Guiana, while “capsicum” the botanical name has been called after the Latin “capsa”, meaning a container. In 1548 cayenne was introduced into Great Britain. The components of cayenne are vitamins C, E, carotenoids and capsaicin, which gives cayenne its healing properties. Capsaicin is also the ingredient that gives peppers their "heat." The hotter the pepper, the more capsaicin it contains. In addition, capsaicin acts both to reduce platelet stickiness and to lessen pain. Capsaicin increases in the amount of substance P released. Eventually, the substance P is depleted, and further releases from the nerve ending are reduced. Creams containing capsaicin have reduced post-operative pain for mastectomy patients and for amputees suffering from phantom limb pain. Prolonged use of the cream has also been found to help reduce the itching of dialysis patients, the pain from shingles and cluster headaches. Further research has indicated that capsaicin cream reduces pain associated with arthritis. The repeated use of the cream apparently counters the production of substance P in the joint, hence less pain. Reducing substance P also helps by reducing long-term inflammation, which can cause cartilage break down. For external applications Cayenne Pepper Extract is used to treat a number of skin irritations and good for natural acne treatment. The list of the most effective ingredients that benefit skin and help in facial acne treatment : Aloe Vera, Dandelion Root, Yellow Dock, Echinacea purpurea, Burdock Root, Red Clover, Sarsaparilla Root, Accutane, Licorice Root, Kelp, Cayenne, Tea Tree Oil.